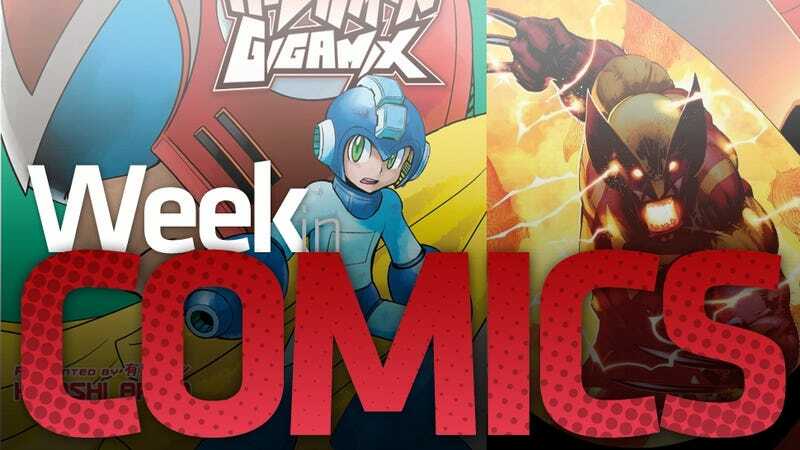 New comics come out in comics shops and on some of your favorite portable devices each Wednesday. Not all of them are worth your time and money, but some are. Some are even about video games (others are about Wolverine). Astonishing Spider-Man & Wolverine The final issue of writer Jason Aaron's surprisingly fresh time-spanning adventure starring Marvel's two most famous characters. Aaron's Wolverine comics have been can't-miss for a while. Here's the plot summary for this one: "Wolverine is the new Dark Phoenix." FF #4 My favorite new comic of the year, so far—and I am not a Fantastic Four fan! In the previous issue, Mr. Fantastic's young, genius daughter assembles the Fantastic Four's most dangerous enemies. Her mission for them: figure out how to repel the actions of a bunch of malevolent alternate-universe versions of her father. This issue starts a new storyline… though it's really just continuing the one I told you. Strange Adventures For some reason, Vertigo is publishing a one-shot of sci-fi stories by the likes of Peter Milligan, Jeff Lemire and the 100 Bullets team of Brian Azzarello and Eduardo Risso. An automatic purchase for me. Green Lantern #60 , Green Lantern Corps 60 , and Green Lantern Emerald Warriors #10 Surely there weren't supposed to be three new chapters of the War of the Green Lanterns saga hitting comics shops all at once. Regardless, what I thought would be a trite Green-Lanterns-Punch-Each-Other crossover has turned into an exciting Hollywood blockbuster of a scrum with some imaginative crises befalling our heroes (i.e. the main guys having to use different-colored rings). This crossover has impressed me more than the more ballyhooed Marvel and DC line-wide crossovers Fear Itself and Flashpoint, which, in contrast, have read like creations of corporations, not fun yarns. Star Wars Legacy War #6 Writer John Ostrander's excellent run of post-Return of the Jedi comics concludes. The adventures of Cade Skywalker have been wrapped in intrigue for years and they end here. This is the finale to a mini-series that caps Ostrander's saga. Presumably Jedi live and die and Cade finally decides which side, if any, he's on. I'm glad I caught this run at least mid-way through and I'm sorry to see it end. Mega Man Gigamix Vol. 1 Official summary of this manga by Hitoshi Ariga: "Gigamix Vol.1 sets the stage with an exciting outer space adventure where Mega Man faces off against the Robot Masters of Mega Man 3, as well as the gigantic Gamma robot! The space setting of this tale acts as a prelude to Gigamix Vol.2 & 3, where all robots good and evil alike must join forces to defend the Earth from the ultra-powerful Stardroids! This two-part epic features every single Robot Master from the first eight Mega Man games, plus fan favorites like Bass, Treble, Proto Man, Duo, the Stardroids, Rush, Beat, Roll, Dr. Wily, Dr. Cossack, Dr. Light, and of course the blue bomber himself-Mega Man!" *Exciting new feature* I write most of this column about comics I've yet to read. It's mostly guess-work, people—guess-work backed by years of reading thousands of comics. But still, shouldn't I tell you about more comics that I've read? As I promised last week, I did read an issue of Days Missing, a series I knew nothing about from a publisher I'd nerve heard of. (Archaia, an outfit run by the son of Star Trek creator Gene Roddenberry). It was… okay, not my favorite thing I read last week. The Days Missing comics are about an immortal man who shows up on crucial days of Earth's history, intervening in key, possibly extinction-level events. Good set-up, but dry in the telling. No, the best comics I read last week, were by my favorite writer, Grant Morrison. Specifically: Batman Incorporated #3-6 . The series features Bruce Wayne traveling he world, trying to recruit people to essentially become the Batman of their country. Issues 3-5 are a single, brilliant arc, featuring Batman trying to recruit the Argentinian crime fighter El Gaucho. But somehow this story turns out to be about an evil, possibly immortal Nazi as well as an exploration of the legacy of Batwoman, a heroine who has been— what's the word… played?— by two different women. Never cared much about Batwoman lore. Now I do. Great stuff about a character who, decades ago, seemed to be introduced into Batman comics just to get a woman in the mix and make the Batman-Robin, grown-man-and-teenager buddy relationship less subject to giggles. Morrison can tell an emotional story out of that, sure! This Batman Inc arc. It's bravura storytelling that threads several narratives, spread across multiple decades, into one taut tale. Possibly even better is issue six, which is a standalone issue that shows what this Batman Inc. enterprise is about. It includes a marvelous scene in which we discover that Bruce Wayne likes to go on message boards and post troll comments about how Batman really is Bruce Wayne. The idea is to make people doubt any theory, he says. Great stuff.